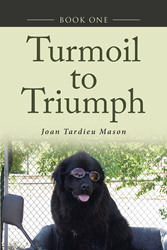 “Turmoil to Triumph: Book One” from Christian Faith Publishing author Joan Tardieu Mason is a heartwarming story of Ana, a surgical technician who moves away from home and her disabled sister to start a new life and a new job in another state’s local hospital operating room, accompanied only by her Newfoundland, Sophie. This life-changing move brings her face-to-face with the owners of the old farmhouse she is to live in, an unexpected love interest, a Bible study group she is to lead, and a pair of twins whose lives she is to change forever. “Turmoil to Triumph: Book One”: an engaging story of a woman guided by prayer to change her life and those of others. Turmoil in her life attempts to derail Ana as she moves to a new state and away from her sister, who is disabled. She is accompanied by her Newfoundland dog, Sophie. She finds a new job in the operating room at the local hospital. Gwen and her brother, Hunter, are owners of an old farm they inherited. Ana arranges to rent the farm house from them. Hunter has been self-absorbed with a heavy, bitter heart from previous losses. He is turned around from the moment he meets Ana. Gwen owns a coffee shop and she and Ana become fast friends. Ana is invited to a bible study and is introduced to a new church. Circumstances lead Ana to take over the bible study group for the high school girls. It is there she meets twin girls and helps them begin a new life when they come to her for help. The relationship is challenged due to dangerous obstacles. The power of prayer shows them a clear direction where triumph will be achieved. Published by Christian Faith Publishing, Joan Tardieu Mason’s new book is a highly readable tale that seems largely shaped out of the author’s own life, featuring God’s power to transform. View a synopsis of “Turmoil to Triumph: Book One” on YouTube. Consumers can purchase “Turmoil to Triumph: Book One” at traditional brick & mortar bookstores, or online at Amazon.com, Apple iTunes store, or Barnes and Noble. For additional information or inquiries about “Turmoil to Triumph: Book One”, contact the Christian Faith Publishing media department at 866-554-0919.